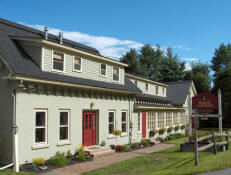 The Brass Lantern Inn is located in the picturesque town of Stowe, Vermont. Here you can find colorful clapboard facades and hand-painted wood signs, pastoral scenes and snow-capped hills. 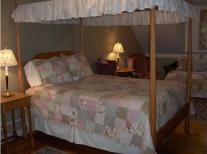 You can also find ghosts here…at the Brass Lantern Inn. There is a common story several guests have shared. Apparently they would overhear “people” arriving late to their room talking and laughing excitedly and loudly enough to be heard. They seem to talk about the good time they just had, like at some party or dance. The plot thickens when it is realized that no other guest happen to be registered in the room where the voices were coming from! In all of the accounts, it's in reference to the same room, always late at night, and with similar descriptions as to what they heard the other guests saying. And always, there were no guests across the hall. The real guests were the only ones in a room on that stairwell. Pretty cool. For more ghostly activity while in Stowe, please visit Emily's Bridge, Vermont's Haunted Covered Bridge. The bridge was built in 1844 and is formally known as the Gold Brook Bridge or Stowe Hollow Bridge. But for the more savvy folk in Stowe, it is more affectionately known as Emily's Bridge - so named for the ghost who haunts it.